This entry was posted on November 1, 2016 by Cole Quinnell. 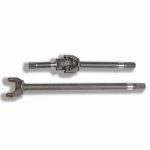 Dynatrac introduces 40-spline 1550 front axle shaft kits designed specifically for the ProRock XD60™ and ProRock 80™ front axle assemblies. The massive axle shafts are part of a complete 40-spline 1550 LT® package for these axles, providing customers with unmatched strength from hub-to-hub. And they are 100 percent made in the USA. Dynatrac axle shafts are made from 4340 chromoly steel, and feature a proprietary heat-treating process to give them optimal torsional strength, while maintaining toughness and ductility to absorb shock loads that might otherwise damage differentials and ring-and-pinion gears. The one-piece forgings add significant reinforcement around the axle joint caps to protect against deformation under intense loads, a leading cause of steering-joint failure. The steering joints are 1550, the largest available in the industry. Steering angles up to 50 degrees are attainable with these Dynatrac shafts and 1550 LT wheel ends, giving customers a tight turning radius. Dynatrac 1550 LT wheel ends. These wheel ends provide clearance to swing the massive shafts and steering joints. To facilitate service, the 1550 LT wheel ends are designed so that the entire shaft assembly can be slid in and out without removal of the knuckle from the end of the axle housing. New Dynatrac 40-spline DynaLoc™ hubs. In addition to having larger and stronger internals designed specifically for a 40-spline outer axle, DynaLoc hubs are three times stronger than competing hubs, and with a unique gear design that won’t disengage under high torque load. They feature a low profile, keeping them tucked farther inside the wheels and more protected from trail damage. The locking mechanism also requires only an 1/8 turn to engage and disengage. A 40-spline ARB Air Locker is exclusively available through Dynatrac. This version of the ARB Air Locker has been engineered to accept 40-spline axle shafts and oversized Dynatrac ProRock XD60 carrier bearings. It is also equipped with the industry’s first oversized carrier bearing trunnion that will not deform or cone-out under severe loads. This combination builds upon the unique strength characteristics that make the ProRock XD60 the strongest and lightest axle in its class. And no axle matches the ground clearance provided by the patented ProRock® design. For more than 25 years, Dynatrac has been the industry leader in high-performance axle and drivetrain assemblies. Dynatrac products are designed using the finest materials, processes and engineering available, and its products are backed by the best service and warranty in the business. From complete replacement ProRock® axle assemblies to high-quality replacement and upgrade components, Dynatrac is committed to delivering the best performance, reliability and quality possible.